Download the Best and Free Project Plan Template in Excel Format. This free project management template is available in Excel 2007, 2010, 2013,2016 to download. Project Plan Template Excel is the most useful Project Management Template created using Microsoft Excel. This Free Excel Project Plan Template is a Must have Work tracking Planner comes with a Sample Dashboard & Gantt Chart. You can schedule the Tasks and timelines in Microsoft Excel 2007,2010,2013 and 2016 formats. Project scheduling Template is another important Project Management Template helps effectively Plan and Manage the Project. So, once we are done with the project initiation, we have to send the project plan with clear schedules. And a Project tracker should include all important project details. Also, Project Plan Plan should be clear for your clients and the team members working on that particular project. Here is a sample and the best project plan Excel template prepared using Excel 2013. This Simple and Example Project Plan Excel Template with Gantt Chart planner will work on Excel 2003,2007,2010, 2013 and 2016. Following are the example screen-shot and interactive excel online template. you can enter any data see how its working online. This is an excel macro template and Gantt Chart Template, you can freely download at end of this topic. Here is are the list of Free Excel Project Plan Templates for Planning your tasks, activities, projects, resource and time. 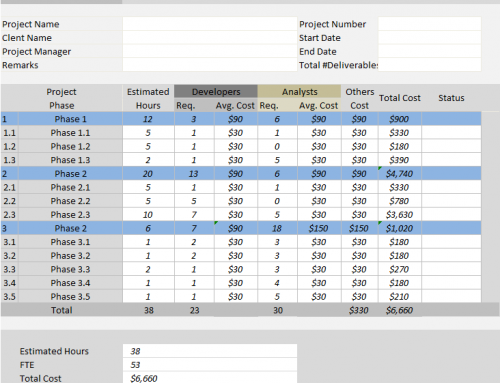 You can efficiently mange your projects using our Free Project Plan Excel Templates. You can download the Files below and open it in Excel and Enter your plans. Each of the below template is create for different versions and OS, you can download and streamline your project tracking using most useful project management templates. 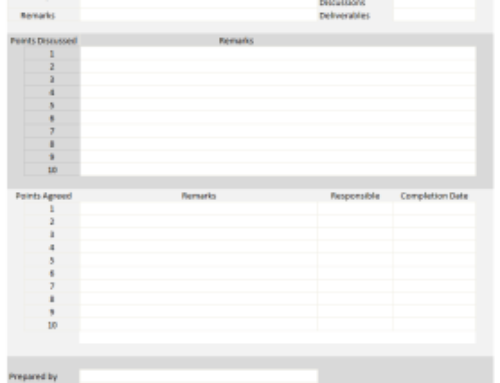 This is a sample screen-shot of Project Plan Template Excel Free Download. It follows the Interactive Project Plan Microsoft Excel Template. You can download the Free Project Plan Microsoft Excel Template at end of this topic. Here is the dynamic Project Plan Excel Template, you can change the status in sample data here and see how the Template and is working. You can not see the buttons in this online interactive workbook, because it is a macros based template. You can download the example file at end of this topic, you can see the buttons in the actual excel template. Well, it is simple! Imagine you are a client and you have a project which can be given to any organization to get it done. So, the immediate questions you will think about is – Who will develop my project? And how many days they will take to complete the project? How they will split the work? How many people will work on it? And what is the cost of delivering each milestone? Also, few organizations follow the standards like ISO standard, and separate business rules and specification. They will prepare the ISO project plan templates and use the same as standard document in their project management. Answers for all these question will be available in our Free Excel Project Plan Template, you can download the Project Plan Template Excel Free Downloadable File at end this article. 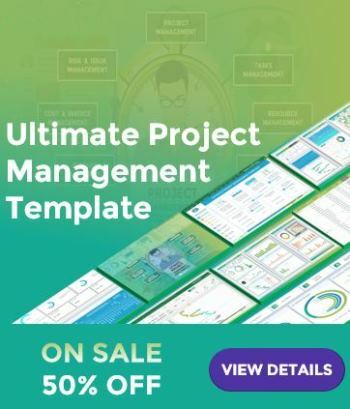 The other similar names to the Project plan template are Project Agenda Template, Project proposal template, Project Planner, Project Task Planning Template, Project Task Assignment Template, Project Task Distribution Template and Project Plan Template Free Excel Download, Project Task Scheduler and Project Tracker. Project Plan Templates can be created based on the project requirements. 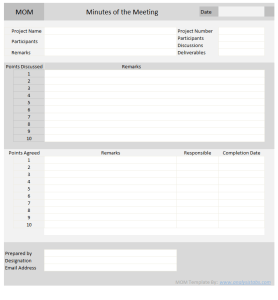 Here are the steps to create Project Plan Templates. The template which we are providing here is for an IT project. Similarly, You can prepare it for any domain like, real-estate, healthcare, retail,ect. While preparing the Project Plan Templates, you can consider the following points. Now your project template will look good with the above details. 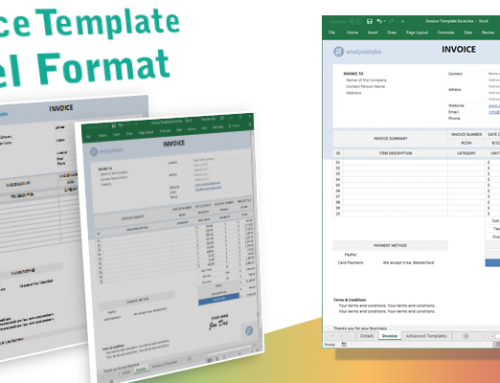 You can use our Project Plan Template in Excel Format – Free Downloadable Template as a base template and change the required fields which you wants to add additionally. Please click on the button below to ‘ download Free Excel Project Plan Template and enable the macro. You can click on any button to toggle the Gantt. Chart and Grid Table. If you need more powerful features, please check out premium templates features below. 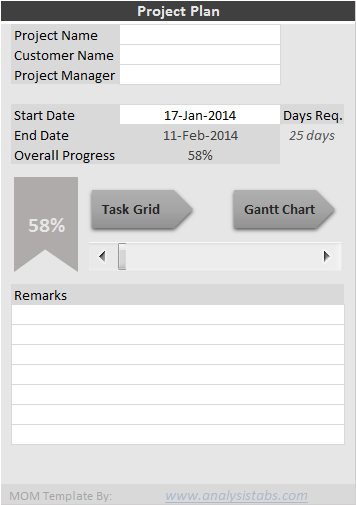 Info: Project Plan and Gantt Chart Template helps you to plan a project timelines and resource. You can change the default data and formula to meet your needs. Usage:We start planning our projects after initial meetings and agreement. We plan our resource and timelines based on the requirements, deliverable and available team and bandwidth. Project plan template helps to track all the tasks and its progress and status of each task. You can daily update the templates and share with your teams and customer/stakeholders to update the project status and progress. This is the must have tool for every project. Fill the information in the white space (do not change any formulas now): Your Project details, Project Start date, Project Manger, Tasks, Programmers or leads and days required to complete the each sub task. There are Two buttons and a scroll bar to handle with our Excel project plan template. We are proving free Microsoft office templates and creating best excel templates for free. You can use this templates while working on your projects for managing your projects. I am preparing all project management excel templates or excel macro templates using Microsoft Excel for Windows. 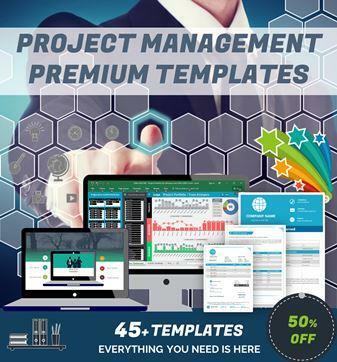 These Excel project management templates (Project Plan Template Excel Free Download.xlsx) should work on all the versions of the Microsoft Excel. Here are the key fields required to capture in this Excel Plan Templates. You can use these field to simply manage your projects and resource. You can create predefined list and for entering the tasks quick and easily. Task ID: Project Task ID is the unique identification number of a Task. It can be a number or string. It is not a mandatory field, it is provided just for reference. Task Name: Project Task Name is a mandatory field. It is short and quick reference of the Activity. This help the teams understand the activity to complete. Task Assigned To: Task Assigned To is Resource filed who is responsible to work on the task and deliver the outputs. Start Date of a Task: Start Date of the Works assigned to a person or start date of an activity execution. Task Duration: Task Duration is Number of hours or man-days required to complete an activity. End Date of a Task: End Date or Due Date of the Task to be completed. Task Complexity: Task Complexity is Level of complexity of a given activity. Predecessors: Predecessors are Tasks which we finish before staring an activity. Task Priority: Task Priority, we complete the Tasks which are in High Priority. Task Order of the Task which we complete. Dependencies: Dependencies are the relationship among tasks helps to order the list of tasks..
%Progress of Task: %Progress or percentage of work completed or % of Task completed. Planned Hours: Planned hours are Estimated hours by Project Development Teams to complete a task. Actual Hours: Actual hours spent to finish the task. All excel spreadsheet templates which we are developing are mostly macro free. However, when we want to provide more interactive features, we are using macros or VBA (Visual Basic Applications for Office) and developing excel macro templates. Most of these Excel spreadsheet templates are free and printable spreadsheets templates. And all these Microsoft office templates are developed using Excel 2013. Also, available online to test the templates. Hope this topic ‘Project Plan Template Excel Free Download‘ helps you to understand and create Project Plan Templates using Excel and VBA. We are trying our best to help you in your project management tasks by creating templates. Feel free to download Project Plan Templates and other Excel Templates available in our blog. Please share your valuable feedback and thoughts with us about our Templates and other stuff in our blog and Forums. How do you add task? the sheet is password-protected. Thanks! I will provide the updated template ASAP. How to set working days (Mon-Friday) inside the plan? can you please share password with us to enable that. PNRao – would you mind providing the password to remove the protection on the sheet. I absolutely love this template and would like to slightly customize this to be able to use it in my business setting. Thanks for your interest, I am working on the new template and can able to make it available in couple of days. love the template, please post the password to make the template usable, thank you. We are working updating all our templates and will be available in couple of weeks. Amazing template but I am not able to use it without the password and also I wish there was a way to view the Calendar Week Numbers in the template. Excellent show! Please share the password of macro as need to modify the structure. Thanks for your feedback, I can’t share the password due to some reasons. However, you can select entire sheet and copy into a different worksheet and modify as per your requirement. I will work on the updated version and make it available for download ASAP. A+ Great Template but I’m unable to use it without the password. Please help! Very nice template, but useless without a password!!!! I understand Martin! I am working on something more useful. I am sure, new things will exceed your requirements. Please bare few more weeks! Very nice template, please provide password!! Is there a way I can expand the columns? my screen is a odd shape. Please provide password via email. Thank you for the template, I believe this will take care of the small scope projects I need to manage. Please reply with password as I need to adjust column and row widths and some otherwise basic customizations. This is a very nice template; however, I may need to add more subtasks or tasks; could I get the password to modify the sheet? Or how can I add these rows? Thanks! Great and helpful tool but I need to increase the data column width and can’t. Do you have the password so I can unprotect the sheet? Great project plan but unable to amend the width of the columns, please can you provide alternative link or passowrd. What is the password? I need to add tasks. Create a new, blank worksheet. This can be in the current workbook or in a new workbook. Display the original worksheet that is protected. The first cell in the worksheet (A1) should be selected. Press Ctrl+C. This copies the selected cells to the Clipboard. Display the new, blank worksheet you created in step 1. Cell A1 should be selected. Press Ctrl+V. Excel pastes the contents of the Clipboard to the new worksheet. Copy and Paste only works so much. There are macros errors popping up when I click on the Gantt Chart. Can anybody help me on the password and how to add in new tasks that’ll also include the Gantt Chart. Great workbook. Need the password and if there is an updated version. By the way, I’ve got more than 4 main tasks.. how to I add more tasks & its sub-task? Please copy the worksheet into new worksheet. And modify accordingly. We are working on the updated version, and can post it ASAP. Rally nice tool…but without the pass it’s totally useless. PNRao – can you send us a password, so we can use and comment on the tool. Was there an answer to the question to be able to set workdays on the sheet instead of including weekends (sat/sun) which are not work days? You can copy the sheet into different workbook and change the formula or Add another column. You can use =NETWORKDAYS() formula to achieve your requirement. Copy and paste onto a new workbook. Could you please provide the password, or the link to the unprotected spreadsheet? Users have been asking for over a year now and although you keep saying you will provide the unprotected version, you still have not. Could you please let us know when we should expect the unprotected version? Sorry for keep on postponing few tasks. Just to inform you, the worksheets are not protected with any password, you can go to Review tab in the menu and click on Unprotect command to unprotect the sheet / or move the worksheet into new workbook. And regarding VBA password, I can not provide the password right now as I need to change the code as understandable by optimizing and adding the meaningful comments. I do not have enough bandwidth to work on many thing simultaneously as I am seriously working on our Add-in along with my job. I will update you guys again in couple of weeks. Hope you understand my present situation! I will provide the better service from another couple of weeks to win your hearts. even to unprotect the sheet from review tab it require password. so please share the password as this excel is of no use without the password. 1. Auto capture of login time and logout time (when i put my pc in shutdown or hibernate the time should capture as logout time). 2. I have to work on various project so should show the current status, something like a milestone and when is the next activity falls. That to minimum of active 2-25 projects. 3. When i lock the PC it should ask me to input the reason for locking for PC, something like break/queries/or you fill as much as options you want. 4. when the sheet is in-active that is when i am changed to some other apps, this should keep working in background or taskbar. 5. Login time the time i open the sheet, considering that i will put this sheet in start menu. 6. So user friendly, share your mail ID, the mail id provided is fake one. as i don’t want to if this is been effective then this can become a so vital tool in a organisation and you can sell it anywhere. if you have any concern, please take your time and consult some of the pro or mentor you know then provide your feedback or comments. thank you for your time. I will check this form by next week. Seriously it is so cool, so great of you. We are going to launch the Premium Project Management Templates& Tools in next 2-3 weeks, which covers all the things to manage the projects more effectively. And regarding the activity capturing (log-in/logout,etc..), We have to add additional functionality to full fill your needs. I suggest you to try our premium tools (which will be available in 2-3 weeks) and we can customize the any tool to meet your needs. Please wait 2-3 weeks, we are seriously working on it and will be releasing to help global project mangers. We do agree that formulas are your proprietary content. but even the heading cannot be changed and also your shud allow the users to chose the color and also need a legend, wen we cut and take itto the next sheet we can add headings etc.but the charts are of no use. do u think we can hv password . Everybody needs pwd. Can you please explain how does the scroll bar works? scrolling to the right while column headers are frozen? I’m assuming there is a macro or vb behind it, do you mind sharing it so i can learn how it was done? Thanks for the feedback! I have used Offset and Scroll bar target range to scroll the data in cells. And sure, I will be posting detailed examples in next couple of weeks. I have locked the sheets to ensure the proper alignment of the shapes and controls, but I have not protected with password. So, you can unprotect the sheets anytime by clicking on the ‘Unprotect Sheet’ command from the Review Tab. When you need to add days to gantt and need to update the macro for the gantt button still asking for password please provide password and completely remove protection that way we can access the vb code. Please provide the password to amend the macro. Only then it will be of use to us. Thank you for this great template. Can you please let me know how I can see more dates in the Gnatt Chart that goes maybe further out 6mths to a year. You can use the Scroll bar to scroll left or right side. Go for the Premium Templates to get more Advanced Options. Very useful templates. It is the best project plan template Excel format. I like the Gantt chart and Task grid option very much. I downloaded the excel you have here (https://analysistabs.com/wp/wp-content/uploads/2014/01/ANALYSISTABS-Project-Plan-Excel-Template-2003.xls) and it goes back to 2003. Do you have an updated version by any chance? How do I remove tasks at the bottom without messing up with formula for the percent complete ribbon? Thanks!